Twitter. Wow. Only through Twitter did I learn about a garden a short drive from home – from someone hundreds, maybe thousands of miles away in the United States. Here’s how it happened. 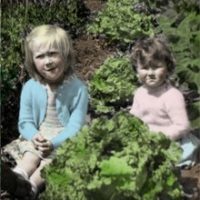 Through Twitter links, I won a copy of the book The Green Gardener’s Guide by Joe Lamp’l. This great book has a focus on organics and permaculture. I commented on Twitter how much I was enjoying it, and Joe himself tweeted back his thanks. In fact, he said, he’d recently been in Toronto installing a community garden. Where? At 3620 Kingston Road, Scarborough. Less than half an hour from where I live! Fiskars, a leading supplier of garden tools, began its Project Orange Thumb program in 2003. The program gives grants to community groups all over the world, as well as doing garden make-overs and providing the garden with the tools they’ll need for continued success. Fiskars selected Toronto as the first Canadian municipality to receive a garden make-over. The City of Toronto had recently purchased the historic Cornell Campbell Farm and its 12-acre grounds, and the community garden is the first project on the property. Canadian Tire donated the plants and materials. Combining sturdy raised beds and in-ground plantings in a sunny alcove off one of the busiest (and noisiest) streets in Toronto, the garden was designed by Joe Lamp’l who, besides being an author, is a master gardener, landscaper and TV host. It was sort of an Extreme Makeover: Vacant Lot Edition. Under a near constant stream of heavy rain a group of dedicated volunteers performed an extreme garden makeover, turning a vacant plot of land into a lush and vibrant community garden.The transformation of the property on Kingston Road next to the Cornell Campbell House was the result of a multi-team partnership and the hard work of 25 community members. All their hard (sopping wet) work has paid off in spades, as we saw on our end-of-June visit this week. 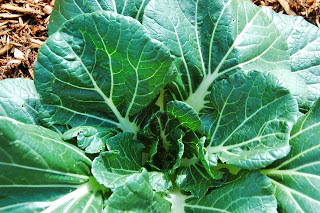 Thriving edibles are planted in multiples which showcases their ornamental qualities. I wanted to take this bed of beautifully scalloped leaved ‘Dusky’ eggplants home! 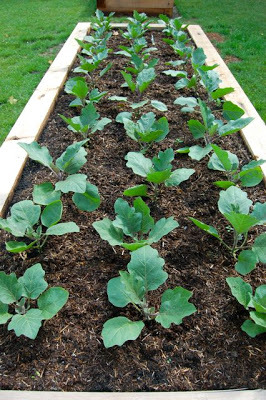 In addition, there are squashes, potatoes, tomatoes, bok choy and caulifowers (looking like green-and-white posies), red onions, even a large bed of strawberries and several rows of raspberries to fill out the berry quotient. We saw a huge variety of herbs, also planted in profusion, ranging from Italian and curly parsley, sage, rosemary, and thyme to Thai basil already in decorative purple-and-white flower. 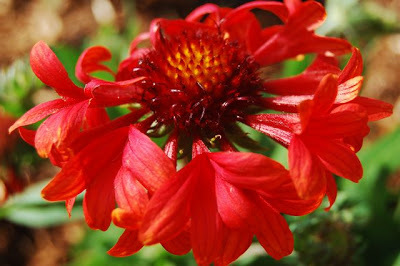 A focus on ornamentals that attract pollinators, including Compositae family members like gaillardia and asters, and shrubs such as butterfly bush (Buddleia), will make the garden an enchanting place to be, once the plants reach mature size. We played a “what is THIS” vegetable guessing game many times while there. Happily many beds still had their nametags. Thank you, Joe! A showcase garden is always improved by good labelling, so a gardener can take the info and re-create favourite plantings elsewhere. At one point I looked around and thought, the only thing missing are benches. Then I realized that the raised beds also make great places to sit. Possibly this was intentional, as they’re just the right height, sturdily constructed from 6 X 6 inch, square, untreated wooden logs. 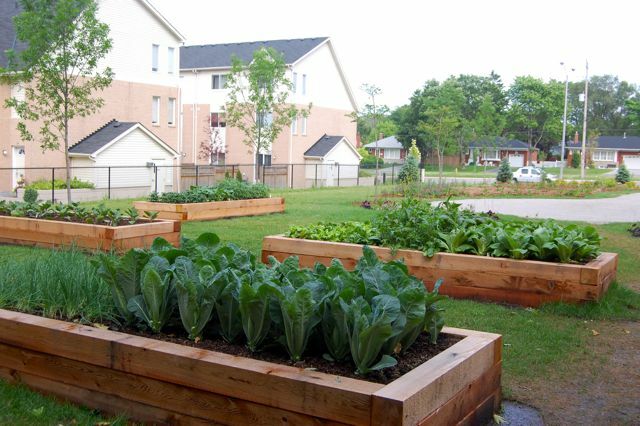 The garden is under the auspices of the Scarborough Village Community Garden Committee, a group of mostly local residents who will oversee and manage it. This we discovered only through later research, as there is no indication at the garden as to who put it there or who runs it. A large, central stone where you’d expect to find a plaque was empty. Perhaps it will come later? Right next to the community garden, separated by a flank of mature trees, the Cornell Campbell Farm offers garden delights of its own. Driving along Kingston Road you might never notice it was there, so I’m glad I had the heads-up to go and visit this secluded gem. We spent a couple of hours poking around this historic garden, as well, which deserves a post of its own. Helen, I'm certain you identified the dragonfly I posted today. Thanks for your help. Hi Sarah. How fun to see the garden a month later and not in the rain! What a fun blog post to read and you did an excellent job telling the story. So descriptive, it made me want to go visit as if I've never seen it before! And I'm so happy to know the garden is settling in well and from the looks of those pictures along with your description, all is well. By the way, the central gathering area in the center of the garden was designed with four benches which were provided on the day of installation along with a large bronze plaque to adorn and commemorate the day for that large stone you mentioned. I'm sure both are waiting plans to be properly and safely secured, hopefully very soon. But yes, the raised beds were by design to be a great height and width for sitting too. Thanks so much for a wonderful post! It's quite fascinating how we learn and get to know about things…. And the Scarborough Community Garden looks so good and neat. The veggies are all very green and healthy. They must have done a great job. Oh, thanks for the virtual tour. It sounds wonderful. If I ever get up there, I'll make a visit. Wow! Interesting post, fabulous garden! Hi, Anonymous, The garden is on the north side of Kingston Road, just a little west of the Sears parking lot, and immediately east of the Cornell Campbell Farm property — all east of Markham Road.